There are going to be those who think that Nikon is at best foolish and at worst mad to launch a new digital SLR with only 6 megapixels. After all, everyone else (including Nikon itself) has affordable 10-megapixel cameras on the market. But that may just be a measure of how caught up we've all become in the megapixel war. After all, image quality doesn't depend solely on megapixels. Our tests of the latest 10-megapixel models suggest that they're intrinsically a little sharper than a 6-megapixel SLR, but not by an awful lot. And there does seem to be a roughly proportional increase in noise because of the smaller pixels. All of which means we shouldn't write off 6-megapixel SLRs just yet, just because there's this temptation to get caught up in the numbers game. The D40 isn't just a cut-down or 'refreshed' D50. It's a completely different camera with a much smaller body - the size difference isn't apparent until you actually compare the two cameras side-by-side. The downside of the size reduction is the reduced body height. This means you can only get three fingers around the grip on the right. It's the same complaint we levelled against the Canon EOS 400D, but it's the price you pay for such compact and lightweight bodies. The D40 loses the status panel on the top plate, too. Instead, all the shooting information is displayed on the new 2.5-inch LCD on the back. And it does look very smart indeed. You can opt for a graphical display with an impressive (but not particularly useful) circular aperture/shutter speed indicator. The intention, presumably, is to offer a quick visual impression of the settings in use. The aperture diaphragm, for example, shrinks or enlarges according to the aperture you've set on the camera. In practice, though, you find your eyes going straight to the numerical readouts alongside, so that after a while you hardly see this graphic at all. With that in mind, the 'classic' interface might prove more useful in the long run. This swaps to larger numerical figures and icons to indicate shots remaining, focus point, image mode and so on. Both displays look very good, and Nikon's taken a leaf out of Olympus's book by making the display interactive. Instead of going through the menus to change ISO, white balance and so on (though you can still do this), you press a 'Setting' button on the back of the camera, then navigate to the option you want to change with the navipad. Once the option is highlighted, you press the 'OK' button to display a menu for those options. It sounds fine, but it's rather slow to use. The problem is that the info display switches off after you've taken a shot, and to display it again you have to press the Info button on the top. There are other cameras, which rely on the rear LCD for shooting information, such as the EOS 400D, but they leave it on all the time. One other complaint. The info display is slow to react to changes. If you don't allow a moment or two to check the on-screen display has reacted fully to your input, you can easily overshoot your intended setting and take the picture with incorrect exposure settings. Don't run away with the idea that the D40 is a dumbed down D50, mind. The image optimisation settings have been extended to include useful Vivid Plus and Black-and-White modes, and there are the same in-camera retouching options as those found on the more expensive D80. The LCD is 2.5 inches, but with double the resolution, a much wider viewing angle and far more accurate colours and tones, it's a dramatic improvement. The D40's EN-EL9 battery is a lot smaller and slimmer than the EN-EL3 in other Nikon digital SLRs, but it still takes 470 shots on a single charge (though maybe this has been achieved by powering down the LCD after each shot). Interestingly, Nikon has dropped the number of focus points down to just three. But this is fine for most people. There may be many fans of sophisticated multi-point systems who will be disappointed, but there must be just as many photographers out there who'll find the simplicity and clarity of the D40's three-point system a welcome relief. 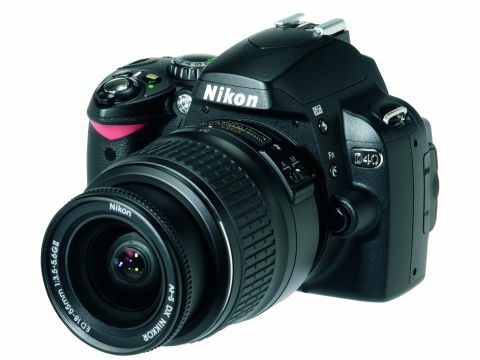 Besides, this camera has a noticeably bigger viewfinder than other non-Nikon rivals, too. What counts most of all in the end, of course, is the picture quality. And here the D40 proves very similar to the D50, with above-average definition for a 6-megapixel sensor, very low noise and good exposure and white balance control. There's some fringing around silhouetted shapes, and some noticeable chromatic aberration towards the edges of the frame. The 18-55mm kit lens is apparently a new version, although its specification is unaltered. It's only an average performer, but this is a budget camera, after all. The price could be a slight sticking point, nonetheless. This is because the D50 kit has been available for £400 or less for many months. So that although the D40 is only £450, it's still a visible price hike for a camera which isn't conclusively better.